Want to see the largest crayon in the world? 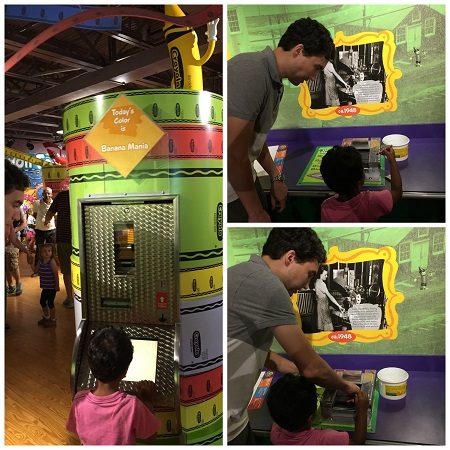 Make a trip to the Crayola Experience in Easton, PA, where even non artsy kids will have lots of fun. With a mix of a factory tour and amusement park feel, it will draw in visitors of all ages. 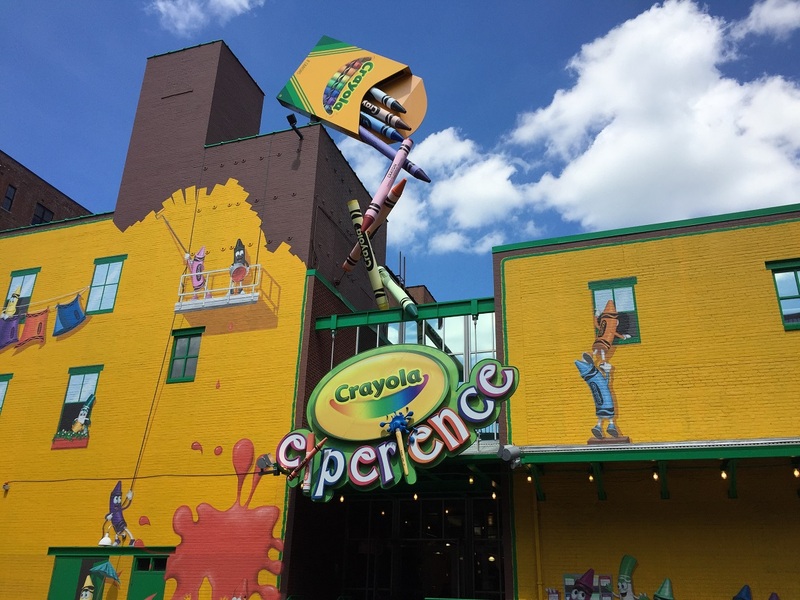 With a similar new attraction in Orlando, Florida as of spring 2015 and another scheduled to open in Minneapolis in Summer 2016, who can resist the urge to melt and mold crayons, create your own crayon label and explore a colorful space? The idea for visiting a crayon factory started with an episode on “ Daniel Tiger’s Neighborhood, one of my son’s favorite TV shows. Seeing his favorite fictional characters learn how crayons are made from melting wax led to my son’s persistent requests for his own visit to a crayon factory. With a little research I leaned that Crayola, the leading manufacturer of crayons does have facilities you can visit. 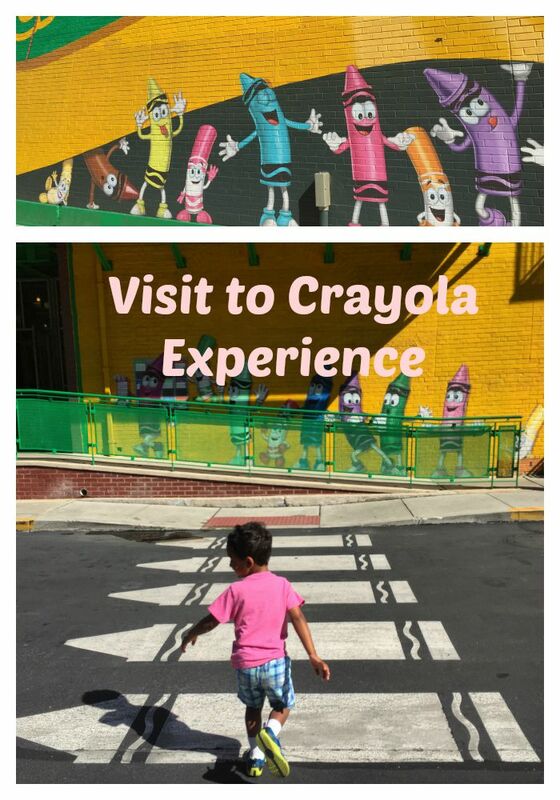 Instead of being a typical factory visit, it is termed as the “Crayola Experience” where it is more than just learning about the crayon making process. 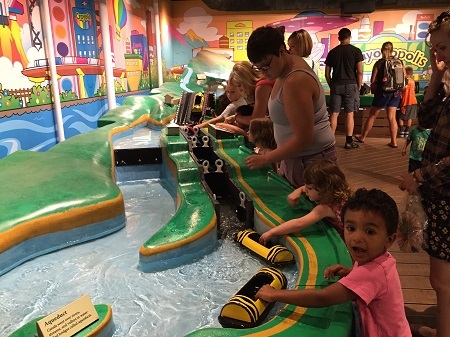 Though kids from babies to tweens can be seeing having fun with all the colorful exhibits, the optimal ages for this experience is between 3-5 years of age. At 3 and ½ years old, my son was able to have fun at the jungle gym, engage in water play and take part in all the interactive activities. The elevators and floor space is conducive for strollers so we had no issue bringing my baby daughter along. There was a great toddler play area restricted ages 2-4 years which was great for kids not yet old enough for the general exhibits. 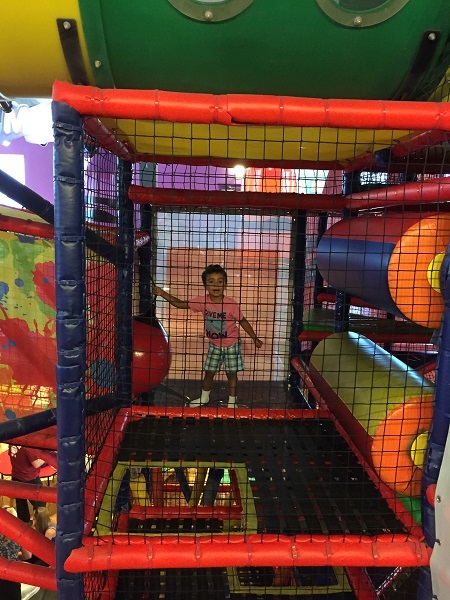 Since the price of admission is the same for both adults and kids at $18.99, you want to make sure the child can access a large part of the attractions. We were there about ten minutes past the opening time (10am) on a summer Friday morning and there was a line formed at the admissions counter already. Parking garage is right opposite the entrance made it easy for our drive in. I would recommend trying to visit on a week day and start your day as early as possible. Three hours will be enough time to go through each of the four floors and engage multiple times in some of the favorite activities. I would avoid getting there early afternoon when most children including my own were not in the best mood as they were getting tired and hungry. Since all the attractions are inside this can also be ideal for days when outdoor fun is not an option. 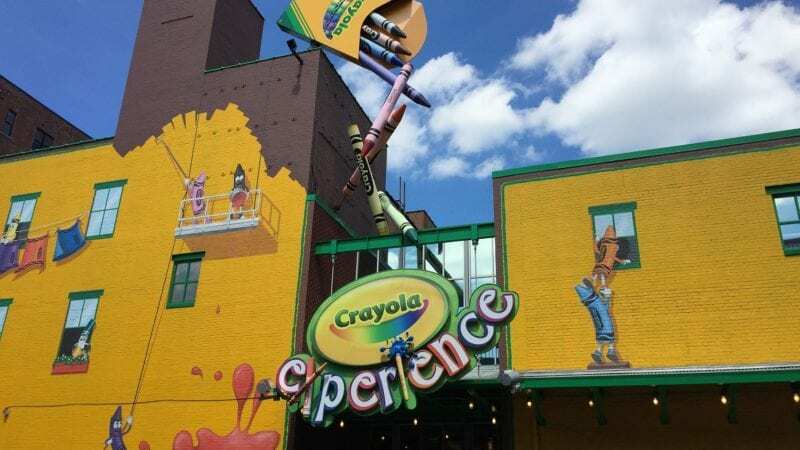 Though the floor plan can look a bit daunting, the “Crayola Experience” was much smaller than we expected, especially when compared to most children’s museums. Yet we used our starting from the top and making our way down strategy as not to miss any of the highlights. I had a print out of the floor plan to share with my son the day before, so we could chart our course. It was fun to watch him learn how to plan and prioritize and feel empowered. This also gives the parents a guideline about the number of activities that come includes with the entrance as well as the extra perks for an addiotnal fee. There were several here that included body art, photos etc but nothing outstanding that was worth our consideration. Even if you’re not a good artist, you won’t be able to resist the melted wax on the fourth floor or bins filled with crayons on the second floor. We seized our son’s interest with unique colors and got some one on one time with him in between the more physically active adventures to create art as a family. These elements made this visit worth it for our group to spend about three hours. With the relatively expensive entrance fee, you would want to consider cost vs entertainment before planning your trip. The entire first floor where you exit is the colorful Crayola gift store filled with everything you can imagine related to crayon products. Any kid walking through this is going to at least try to ask for some overpriced item. Knowing this drill from our previous visits to similar attractions we devised a plan to keep our cost down and crying to a minimum by making the most of the “free” tokens we are given at admission. Each family will get about ten tokens at entrance which you can use for getting crayons and markers from the dispensers. You can make it even more special by making a personalized cover for them. We kept a few of those crayons and markers to handout at the end of the visit so we could get through the gift shop without being coerced to purchase anything. The colorful crayon soft toys also make a great photo op so I definitely enjoyed browsing the fun items but got away without having to buy anything. Having had his fictional experience come to life was definitely a memorable for my son. Seeing his excitement made it more special for us. We made sure to make the most of the visit by arriving early, bringing our own snacks and making memories together. Buying tickets online can also help you save a few dollars as well as skip the line at admission. Here are a few more of other top attractions in the heart of Pennsylvania that have made it to my family travel list.